Japan has announced it will let the US Air Force deploy a number of CV-22 Osprey aircraft at an airbase in western Tokyo from 2017. The move has brought numerous protests from local residents concerned about the plane’s safety record. The Ospreys are to be based at the Yokota Air Base, which is located in the city of Fussa - a densely-populated suburb of the Japanese capital - the US Department of Defense (DoD) has confirmed. The government has been trying to allay fears from irate locals - who are vehemently against the plans - by saying it is crucial to Japan’s defense. “[The deployment] in our country will bolster the deterrent power of the Japan-US alliance and its capability to cope with” various emergencies, Chief Cabinet Secretary Yoshihide Suga told a news conference, which was cited by the Japan Times. “It will also help stabilize the Asia-Pacific region,” he added. Three aircraft are planned to be stationed at Yokota from 2017, with another seven arriving in 2021. The local residents are not happy about the noise that the tilt-rotor planes will generate. However, they are also decidedly uneasy about the CV-22’s safety record. Unlike the MV-22 version that has been stationed at the Okinawa Air Base, which has a relatively clean safety record, with an accident rate of 1.93 for every 100,000 flying hours, the CV-22 has proved to be significantly more controversial. 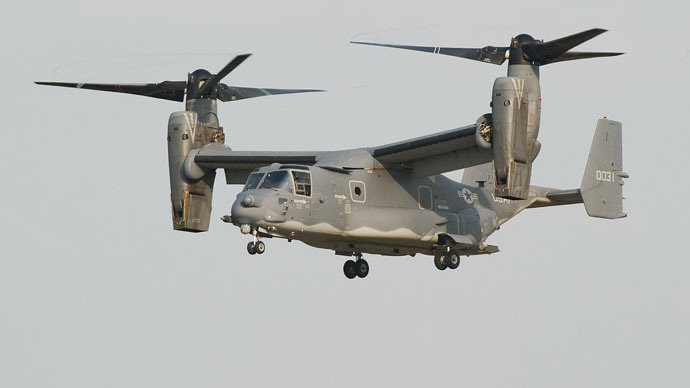 As of July 2012, the CV-22, which is used by the US Air Force, had an accident rate of 13.47, which is over seven times higher than the MV, according to figures from the DoD. The Osprey has been blamed for four accidents that have killed a total of 30 people. “Surrounding areas of the base are crammed with houses,” said 75-year-old Katsuhiko Iwata, a leading member of a residential group that deals with issues involving the Yokota base. “If an aircraft were to crash, it would cause a great deal of damage,” the Japan Times reported. The plane, which can fly at double the speed of its predecessor, the CH-46E helicopter, as well as having four times the range, are regularly used on low-altitude missions. This could be one of the reasons for the CV-22’s higher accident rate. Despite the fears of the local residents, Suga says their safety will not be compromised. “We will naturally put top priority on safety. We should think about it until the latter half of 2017, when [CV-22s] will be deployed” at Yokota, the Chief Cabinet Secretary Suga said. Two Ospreys stopped at the Yokota Air Base for the first time in July 2014, when they refueled en route to the July 20 Sapporo Air Show. They were sent there to try and raise public awareness about the aircraft, as there had already been considerable local opposition. Japan will also soon have its own fleet of Ospreys, as the US State Department confirmed last week Japan was to buy 17 at a total cost of $3 billion. Earlier this year, Japan’s defense budget approved the purchase of five Ospreys for $443.7 million.